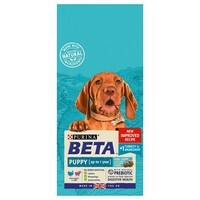 Purina Beta Puppy Food (Turkey & Lamb) is a tasty and complete food for your puppy, specifically designed to provide the best nutritional value for your puppy's development and growth. Made from wholesome ingredients and rich in protein, this bursting with flavour puppy food contains antioxidants to support natural defences, and DHA which is essential for growing puppies. With special puppy sized kibble in two variations, this puppy food will help prolong meal times and help to provide and maintain excellent oral health. Give your little pup the best start in life with this expertly formulated and deliciously good Purina Beta Puppy Food!